A consultant at KPMG, Senior Executive with Unilever, Scholar during graduation and a trained Kathak Dance. Tanu Sood, a student at IIMB EPGP program, is having it all. 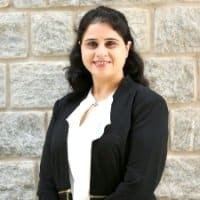 GyanOne interviews her on Why did she choose IIMB, Life at IIM Bangalore, her learning curve during the application phase and beyond. There were several factors to consider when I decided to pursue an MBA such as the learning opportunities, experiential learning as well as future career prospects. The IIMB EPGP program is designed to cater to the learning needs of experienced professionals. Case based learning, a stellar faculty and a diverse cohort add to the learning opportunities within the class. The class has a healthy mix of experienced professionals from different areas such as PSU, Finance, Analytics, Operations, Technology. Live projects and comprehensive project provide hands on learning experience. So all in all, this is a very good choice for an experienced candidate like me wish to get back to the workforce within 1 year. Post GMAT, I wanted to capitalise on the good score and ensure conversion. Hence I sought professional help for the admission process. The team at GyanOne, especially Swati helped me with the preparation with mock interviews. What does the IIMB EPGP Interview process look like? The IIMB interview process was quite smooth. A 30 minute written test is followed by a panel interview consisting of 2-3 interviewers. There is often an alumni on the interview panel as well. Each panel can be different in their approach, and the interview may last 20-30 minutes. The interview revolves around the individual profile as well as the general industry knowledge of the candidate. Apart from the theoretical concepts, there is a lot of focus on hands on learning and research. For each classroom contact hour, an outside classroom effort of 2 hours is required and that makes the program quite intense. Being a one year course, EPGP is fast paced. The international immersion and GNAM exchange in term 3 and 4 provide for opportunity to tap into resources of other international B schools as well. We also get to work on a live business problem with an organisation through the comprehensive project which allows us to apply our learning to real business situations and is as real as it gets before we re-enter the workforce. Outside class initiatives include initiatives like organising events such as Digital Summit and Sammantran which are EPGP flagship events. A lot of the initiatives such as Seminar series, EPGP Branding, Alumni connect, Prayaas – a Social initiative are student driven and allow students to develop holistically. These events also help with networking with alumni and industry. The program inculcates a habit of research, critical and analytical mindset in the students and these are life skills that will go a long way. It also opens up avenues and helps you understand your potential better. E.g., All throughout my 9 years of career, I was pretty confident that I do not understand Finance and am not suited for a career in marketing. Things seem to have changed in the last 6 months, and now I can hold a conversation about Finance related topics and am considering a career in marketing. The industry and alumni connects have really helped me understand numerous aspects of the business and current industry trends.